A tasty 14 month Swiss Gruyere, dense in texture, with a fruity, floral flavour that lingers in the mouth. Originally Gruyere cheese was only made in and around the swiss town of Gruyere which was founded in the canton of Fribourg by the religious counts who settled there in the 9th century. Nowadays, however, the production has spread a little wider, although the cheese is still made in village dairies. Gruyere must be made in Switzerland due to its Protected Designation of Origin (PDO) and is made using knowledge that has been handed down through the generations. However, the French are in the habit of calling their Emmental under the name Gruyere, as is the case with a number of similar style, cooked cheeses like Comte and Beaufort. Gruyere comes in the shape of a wheel that weighs 25-40kg and should have a clean, even coloured, brown and grainy rind. 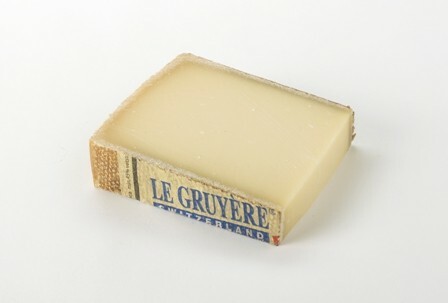 The best Gruyere can have small holes in the body of the cheese, around 4-6mm in size but these are not indispensable. The cut cheese has a fine surface that is slighlty damp. It should be slighlty soft and waxy in texture with an atractive ivory colour that can vary with the season. The taste is dominated by a flavour which is gently salty with fruity notes and a lactic aftertaste. This flavour can vary too, dependant on the area in which the milk was produced. It is a delicious delicacy on any cheese platter, can be enjoyed with a plate of charcuterie, forms a tasty basis for warm cheese dishes and is an indispensable ingredient for genuine cheese fondue. Super Gold Winner and Best Le Gruyère AOP at the World Cheese Awards 2018.